Annoyance at a mundane direct conflict and head to head combat where the opposition does not and can not bring complex tactics to the fight and where because of their perceptions about the enemy the players don't feel risk or excitment. Boredom and frustration created by a the lack of notable or intriguing elements about the monsters to make them wondrous, interesting, exciting or compelling. The problem D'Anastasio identifies is thus complex and two-fold (at least) both diegetic (relating to the story or narrative and how it's told) and mechanical (relating to how the gamified rules and procedures of combat function). 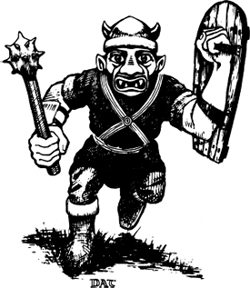 In D'Anastasio's game, and many others I suspect, a goblin encounter is both boring and frustrating because there's nothing interesting to learn about goblins or the setting from the encounter and there is no risk or tension in the encounter. This first problem is the one D'Anastasio provides a prescription to and her prescription, like her diagnosis is fundamentally right, but doesn't go very far. D'Anastasio suggests that the GM "combine the cliched combat encounter with any of those other things [puzzle-solving or story development, discovery]". This creative impulse is good, but might not get one very far as long as "goblins" remain two-dimensional known quantities that present no threat but can only be encountered in combat.